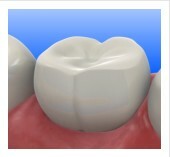 Another advantage to composite fillings is the capability of bonding to tooth structure. Also in many cases they can be repaired by addition of more composite material. Speak with Dr. Head to find out which kind of filling is best for you.